You can upload GeoTIFF image files up to 10 GB in size to your Earth Engine user folder. To upload a GeoTIFF using the Code Editor, click the button, then select Image upload. Earth Engine presents an upload dialog which should look similar to Figure 1. Click the SELECT button and navigate to a GeoTIFF on your local file system. Give the image an appropriate asset ID (which doesn't already exist) in your user folder. If you'd like to upload the image into an existing folder or collection, prefix the asset ID with the folder or collection ID, for example /users/name/folder-or-collection-id/new-asset. Click OK to start the upload. Figure 1. 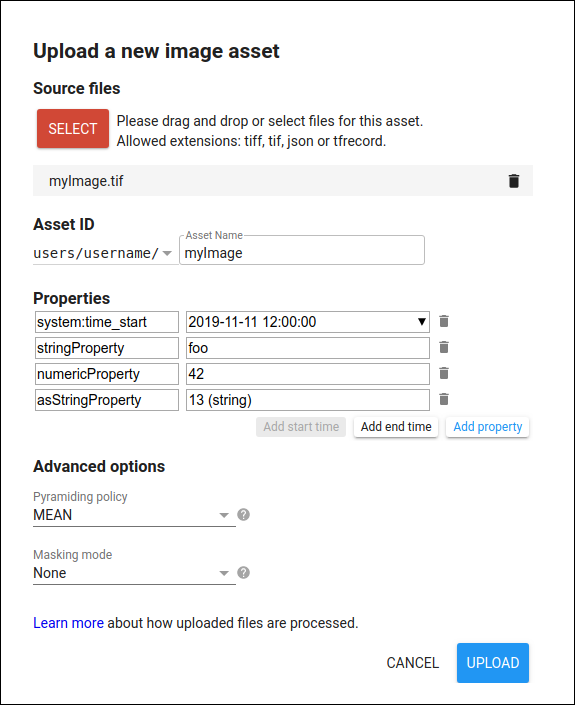 The asset manager image upload dialog. Once you have started the upload, an 'Asset ingestion' task appears on the Tasks tab at the right side of the Code Editor. Hovering over the task in the task manager shows a ? icon which you can use to check the upload status. To cancel an upload, click on the spinning icon next to the task. Once the ingestion is complete, the asset will appear in your user folder with a image icon. Export imagery into one or more TFRecord files. Perform inference on the imagery (i.e. model.predict()). Write the output of model.predict() into a TFRecord file. The predictions should be in the same order as the image exports on which you performed inference. Order can be enforced by a sort of the filenames produced by the export. See the large file exports section for details. Upload the TFRecord file(s) and associated mixer to Earth Engine. Edit asset metadata by specifying one or more metadata properties. Expand the Properties menu and click + Add property to define a property name and value (Figure 2). The value can be a string or a number. Enter strings without quotes. To format a number as a string, enter a single quote (') before the number. By default, a system:time_start property is added with no value. This property is used by Earth Engine when applying ImageCollection date filters. Enter either a date in the format shown in Figure 2, or a number representing milliseconds since January 1, 1970. (See the glossary for more information on timestamps in Earth Engine). The Asset Manager interprets a number entered as the value for a property named system:time_start or system:time_end as milliseconds and formats it as a date. Click the delete icon to remove a property. Expand the Advanced menu to choose the pyramiding policy and the masking mode for your data. The pyramiding policy specifies how Earth Engine generates lower resolution versions of the image. Learn more about how Earth Engine handles multiple resolutions in the scale doc. Choose a 'Mean', 'Min', or 'Max' pyramiding policy to compute lower resolution levels of the image pyramid as the mean, minimum or maximum of each 2x2 group of higher resolution pixels. This is a suitable option for continuous-valued images. For categorical (e.g. land cover) or QA data, choose a 'Sample' (the upper left pixel) or 'Mode' (most frequently occurring value, or sample if there is no mode) pyramiding policy. The masking mode indicates how the uploaded image is masked (if at all). To specify a no-data value, select 'No-data value' and enter the value. Pixels with this value will be masked in the uploaded image. This value is applied to every band of the image independently. To use the last band of your image as a mask for the other image bands, select 'Use last band as alpha band'. The alpha band should be an unsigned 8-bit band where 0 is masked (completely transparent) data and 255 is completely opaque. To upload a single image as multiple tiles, where each tile is stored in a different source file, click Add another file to add additional files to the upload. Earth Engine will combine the tiles to create a single image in your user folder. The images must have the same number of bands, bit depth, projection, resolution and fill values. The offset from one file to the next must be an integer multiple of the pixel size. Gaps between tiles will be filled with masked pixels in the final image, so the tiles should ideally be adjacent and not sparsely spread out. Images with gaps taking up >99% of the image area won't be ingested.